size of their clenched fists – so make every bite count! This is especially important in the early years – because good food habits established in childhood can last a lifetime. Variety in a toddler’s diet is essential for their healthy growth and development. tomatoes, grated carrot, zucchini and cheese. Assess your toddler’s diet over a week rather than day-to-day, and hopefully you’ll see the balance fall in to place. Remember, fussy eating is temporary. If you are concerned, speak to your healthcare professional. What’s an appropriate serving size for toddlers? 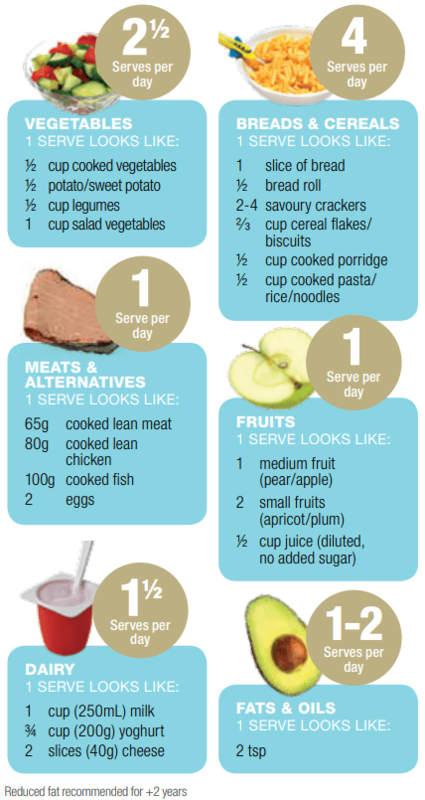 Below is a portion guide from the Australian Dietary Guidelines for little ones aged 2–3 years. It is designed to meet the recommended daily dietary intake. Remember it is a GUIDE only – every toddler is unique, with different metabolisms and energy levels. Fussy eating is normal and common during the toddler years, therefore it is important to try and maintain a healthy balance during this time. If your toddler misses out on essential nutrients such as iron and zinc, this may affect their appetite, behaviour and energy. Simple additions to their diet may help with tiredness and lethargy (which may be caused by inadequate iron and energy intake) or irregular toilet habits (which may be caused by inadequate fibre intake). This brochure offers some handy tips, as well as suggestions for setting up healthy eating habits, which may help your toddler get more of the nutrition they need. INCREASE FIBRE AND VITAMINS – grate or finely chop vegetables such as carrot, zucchini or pumpkin into pasta sauces, casseroles or muffins. Chop fruit into bitesized pieces and thread onto skewers or cook into biscuits, scones or scrolls. INCREASE IRON – red meat, chicken and fish are great sources of well-absorbed iron. Eggs, legumes and iron-fortified cereals are good sources, and adding food high in vitamin C (tomato and oranges) during meal time can enhance the absorption of iron. INCREASE ZINC – serve a few seafood meals per week, such as salmon patties, tuna mornay or crumbed fish. INCREASE PROTEIN AND ENERGY – double or triple eggs in baked items like pikelets or pancakes, or add almond meal in place of flour. USE S-26 GOLD® TODDLER milk drink in place of regular milk when preparing cereals or cooking meals such as frittata, quiche, scones, scrolls and pikelets. Encourage children to try something new by putting one piece of food on their plate at a time ...it all starts with one pea! - For allergy prevention, do not delay introducing foods such as smooth peanut butter, eggs and wheat. If you have any concerns, see your GP or healthcare professional.